Adi Iskandar takes over the wheel without killing someone. Is it possible for us to write a review of a film without once referring to gender identities? On the literal level, yes, absolutely. However, given how we’re reaching the business end of our academic research project, do forgive us if more than just a few words are dedicated to that area of the field. This field, though, is wide and varied; there’s plenty more we can talk about besides that. For a film like ‘The Man from Nowhere’, intertextuality and star formations come into the play. It stars Cha Tae-sik (Won Bin), a character of few words leading a quiet life as a pawnshop keeper. The noise comes from So-mi (Kim Sae-ron), a young girl who lives next do with her mother, Hyo-jeong (Kim Hyo-seo), who is unfortunately a drug addict. Seeking to escape from that mad existence, So-mi’s relationship with Tae-sik intensifies, to the extent that he becomes her only friend. As much as Tae-sik loathes admitting it, the reverse is also true. One day, So-mi pawned a bag to Tae-sik without realising that it contains stolen drugs inside. They belong to drug lord Oh Myung-gyu (Song Young-chang), a menacing character who does not take being fooled for lightly. He dispatches his two most trusted lieutenants, Jong-seok (Kim Sung-oh) and Lum Rowan (Thanayong Wongtrakul), to get both his drugs and both the girls for his own purposes. It is this same situation and fate from which Tae-sik hopes to rescue the girls from. In some of our previous reviews of Korean films, we’ve discussed the trend noted in Korean films of hyperviolence. The analysis conducted was usually related to gender, but sticking purely to a consideration of violence, ‘The Man from Nowhere’ continues this particular tradition particularly well. 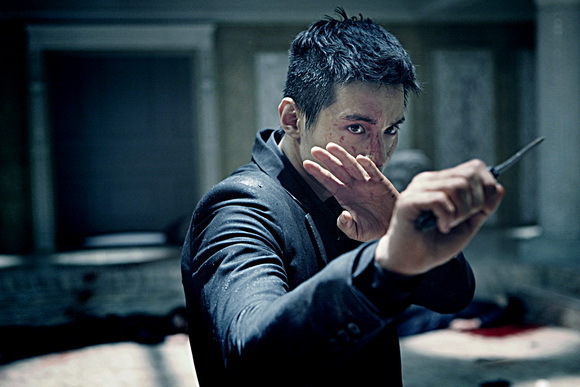 Won Bin’s physical conditioning allowed for us to reimagine him as a sleek fighting machine, relentless in his pursuit of justice for characters trampled upon. At some points, I identified elements related to the idea of a messianic saviour, though linking him directly to the big man JC himself is probably a step too far. The fact remains, though, that there is indestructability here, an aura present in his body that gives rise to a greater penchant for physical torture and pain. It’s interesting that such violence could be found in a film that essentially highlighted (the loss of) innocence. This works on two levels. Firstly, as the younger character, So-mi brings with her all that is fragile and pure that many regard as virtuous values in society; though there were moments when I wanted to exclaim, “Dang, girl, don’t stick your nose in there!” These are easily explained by way of curiosity getting the better of her. It didn’t quite kill the cat as the saying may go, though, but the (secondary) MacGuffin in this particular film is the innocence as portrayed by the girl (perhaps a representation of the helpless and less powerful and privileged in society as well), as well as the drive to preserve that innocence. There is a quote in the Bible, as popularised by none other than Samuel L. Jackson himself, whose delivery is forever imitated: “Blessed is he who, in the name of charity and good will, shepherds the weak through the valley of darkness, for he is truly his brother’s keeper and the finder of lost children.” The essence of that part of the quote is visually replicated, as Tae-sik becomes a figurative force of nature to be reckoned with in finding and saving at least one lost child. This could be contrasted greatly with the darkness that is of righteous retribution. Again, we go back to Ezekiel 25:17: “And I will strike down upon thee with great vengeance and furious anger those who attempt to poison and destroy my Brothers. And you will know I am the lord when I lay My vengeance upon you.” It seems like a bombastic statement, and certainly not in keeping with the mutability of Tae-sik for the majority of the film. He speaks primarily (and at times only) through his actions; given how vicious and effective he is in extracting the required information, one is not left in doubt at the volume of his message. Nevertheless, as easily as the dark following the light, it is this form of vengeance and punishment that is employed in defending the innocent. Having an understanding of the star and his body of work would be useful on the next level of comprehension. Here, I’ve mentioned how Won Bin brings a physicality previously unseen in many of his acting roles thus far in his career. By that, I am comparing his character here directly to that which appeared in ‘Autumn in My Heart’, which was over a decade ago. “But Adi,” you ask, “why would you do such a thing? Surely he would have acted in other roles as well?” Well, ladies and gentlemen, the answer to that would be in the negative; despite being what one would consider as fairly talented and good looking, the fact remains that the Daniel Day-Lewis of South Korea (at least in career choice) is incredibly picky about the stories in which he is a part of. He had a semi-active career in film and television prior to this (we reviewed him in ‘Mother’), but it’s been very slim pickings for more than half a decade now. As such, he is a unique film star in the sense that the star construct is little more than flimsy scaffolding founded on rickety pillars. As such, this sense of innocence relates to a concept Indonesians would term as ‘polos’. It essentially means clean, which has allowed for the semantics to relate it to innocence as such, but perhaps the term ‘unblemished’ would be more accurate. 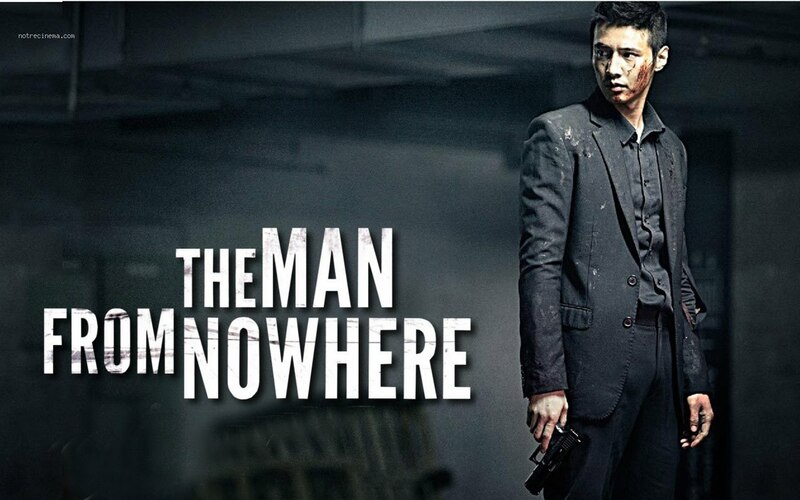 Primarily because we know who he is but know very little about him, Won Bin becomes the perfect man from nowhere. We can therefore project more of our own ideals and principles unto his character (and star construct), which would ironically deem him as the perfect (film) star to fantasise about, simply because he is not one. I believe that has contributed not only to the film’s box office success, but also its popularity outside of the domestic market. The success of this film allowed the director Lee Jang Beom to segue into ‘No Tears for the Dead, a large part of which was located in the United States. It also allowed them to hire Hollywood-based actors such as Brian Tee, and I do not believe that would have happened without both ‘The Man from Nowhere’ and the man from nowhere that is Won Bin. Adi recommends you watch the Korean version, rather than the English-dubbed one.